The new, stylish Trolley Cases from Phi Displays are a brilliant alternative to the larger Shuttle Cases. Trolley Cases are not only a more stylish solution to transporting Display stands, they are also less expensive. If you are looking for a more compact carry case at a more affordable price, Phi Displays Trolley Case is a great choice. Our trolley cases are amongst the best in the industry. They are suitable for a variety of exhibition, conference and other travel needs. Our Trolley Cases are light enough to carry but are large and strong enough to house your Pop Up Frame and graphics. 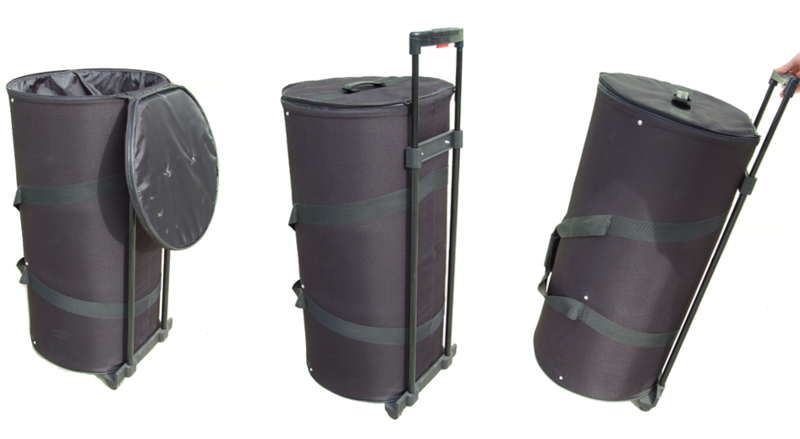 The lightweight, easy to use Trolley cases can be used to transport all the current pop up systems. The trolley case from PHI Displays has a retractable handle to reduce storage space when loading and wheels so it is convenient for moving around to and from exhibitions. Take a look at some ways in which you can use our trolley cases below. For any help, get in touch with us and we would be able to help you with your custom transport requirements for your exhibition related trolley storage and transportation needs.